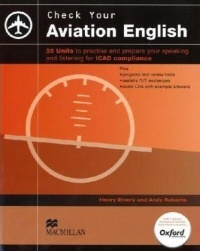 A self-study or classroom book and CD package focusing on the topics and language structures required by pilots and air-traffic controllers preparing to gain ICAO (International Civil Aviation Organization) Level 4 language requirements. The book contains 30 two-page units. Easch unit is focussed on a unit topic and contains activities to practise speaking and listening skills as well as activities to develop key vocabulary. Tasks are similar to task types which are common to aviation English exams. Listenting exercises use plain English recordings as well as RT exchanges and also feature routine and non-routine situations. Mit dem Test nach jeder fünften Unit sowie einem Abschlusstest können Lernende ihren Kenntnisstand evaluieren und abschätzen, welche Fertigkeiten ihnen für die Prüfung noch fehlen. Dieses Material lässt sich als Kursmaterial oder als Selbstlernmaterial einsetzen und wurde von der Oxford Aviation Academy geprüft. Zur Vorbereitung auf das ICAO-Zertifikat geeignet.